The Gray-cheeked Thrushes (Catharus minimus) are strongly migratory songbirds that breed as far north as Siberia, Alaska and northern Canada and migrate to South America for the winter. These greyest of all North American thrushes have the most northern breeding range and migrate the longest distance of all small thrushes. Until recently, the Grey-cheeked and Bicknell's Thrushes were considered conspecific (one and the same species). Even though the Grey-cheeked Thrushes have a much larger range across North America than their close relatives, the Bicknell's Thrushes are typically found closer to urban areas and are, therefore, more likely to be encountered. The breeding territory of the Grey-cheeked Thrushes extends from northeast Siberia across northern Alaska east to northern Canada to north-central Quebec, Labrador and Newfoundland; and west to northern Ontario, Manitoba, Saskatchewan and northern British Columbia. In fall, these birds migrate south for the winter. During the migration, they travel mostly through eastern two thirds of the United States. They migrate mainly at night. They winter in the northern part of South America, specifically Colombia, Venezuela, south to Peru and northwestern Brazil. Other populations spend the winter on islands of the West Indies. Rare vagrants have been reported in Europe. Range: Breed in extreme northeastern Siberia, Alaska and Canada. Winter in northern South America (including Colombia, Venezuela, Peru and Brazil), mainly east of the Andes mountain range. Back is dull olive-brown. Below spotted pale with greyish flanks. Bicknell's Thrush very similar in appearance, except for smaller size (average length 2.9 inches or 7.5 centimeters), shorter wings, buffier face and chest, and more noticeable eye rings. Otherwise very similar markings and very difficult to ID in the field. Most easily separated by their different ranges and vocalizations. 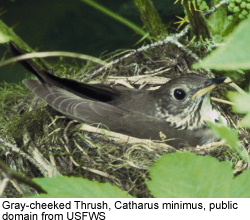 The Bicknell's Thrush is found in the northeast US and Canada - typically spruce-fir habitat above 900 meters or 3,000 feet. Swainson's Thrush has bold buffy eye rings and buffy cheeks (not grey). Veery Thrush is smaller in size (6.5 - 7.75 inches or 17 - 20 cm in length), has a uniformly brown / more reddish plumage, lacks the grey cheeks and with only faint spotting on the chest. Hermit Thrush has a dull brown back, a distinct rusty tail and rump. Wood Thrush: Upper plumage is brown with a bright rusty-colored head. Plumage below is whitish with large dark spots. fruits and berries, including grapes, wild cherries, blackberries and raspberries. They mostly forage on the forest floor. Grey-cheeked Thrushes generally only produce one brood in a season; however, if the first one fails early in the season, they may have a second. The open cup nest is constructed by the female out of dried grasses, twigs, moss, stems and other plant material and the nest is reinforced with mud. Their nests are typically placed on the ground at the base of a shrub or low in branches of shrubs. A nest may contain 3 - 5 pale blue-green, eggs (average 4) with fine brown spotting. The eggs are incubated by the female for about 13 - 14 days. The hatchlings are helpless and both parents feed and protect them. Grey-cheeked Thrushes produce distinctive, high-pitched songs with quick chippers. Their average lifespan in the wild is just over 7 years.